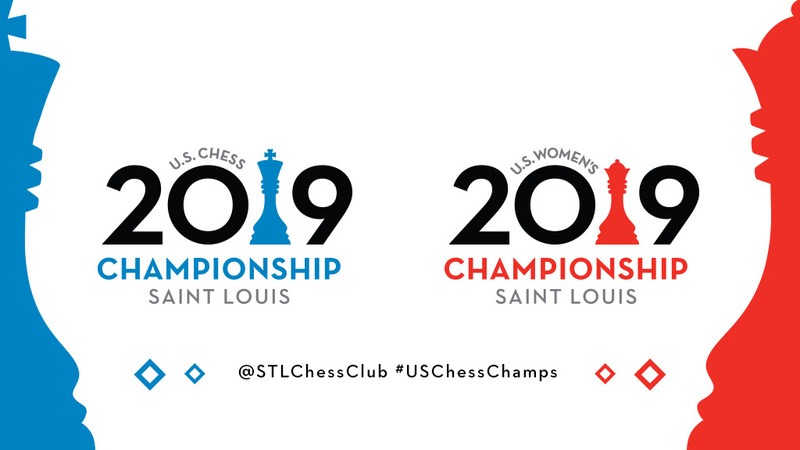 The U.S. Championship and U.S. Women’s Championship is where players come to play, and they are showcasing that ultra-competitive spirit each and every day. With the amount of attention one is exposed to during these events, it is normal that the players will do everything in their powers to play the best chess they are capable of. Let’s take a look at the action games of the round! 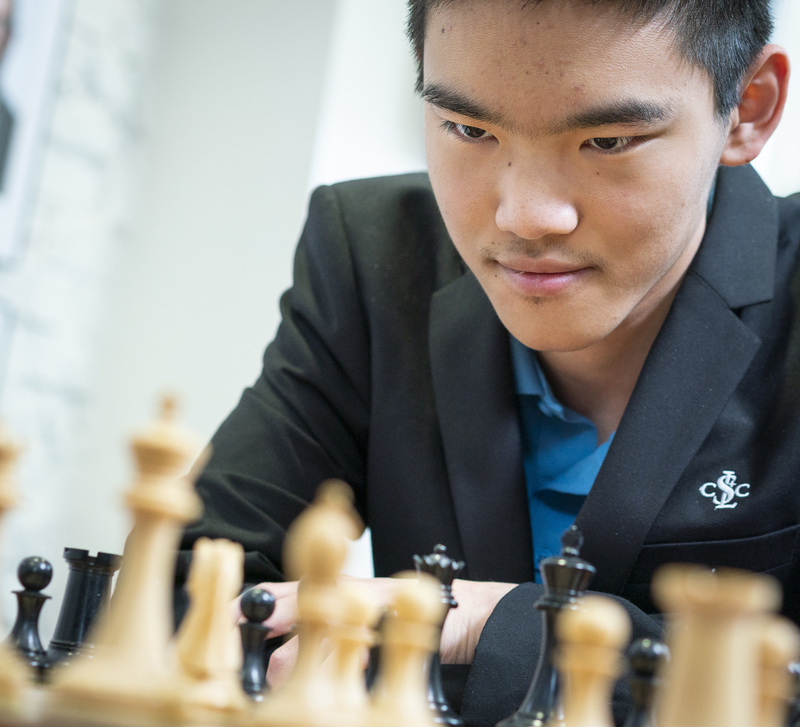 Nakamura has been struggling in the US Champs in recent editions, but surely this year he is looking to make a statement and once again challenge his peers in the quest for the national title. Today’s game proved that he is in great shape, as he defeated his younger opponent with ease. At no point did Nakamura seem to be losing control, and Sevian had to acknowledge defeat soon after the first time control. An impeccable game by Dominguez, who showcases his trademark technical game as he slowly outplays Robson in an Anti Berlin. Black methodically picked at his opponent’s pawn structure, and ultimately achieved a good knight vs bad bishop endgame. Robson had a difficult time finding any ounce of counter play, and had to accept material loss before the first time control. Dominguez nursed his advantage with care, and forced Robson’s resignation at move 51. 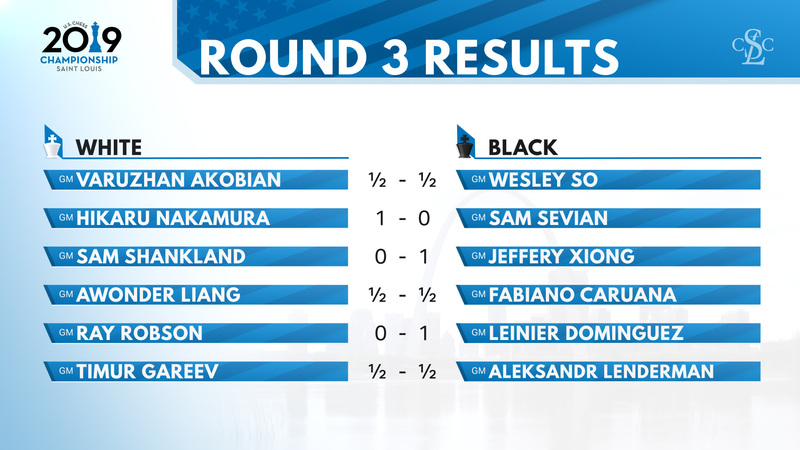 This is the first victory at the U.S. Championship for Dominguez, who triumphantly announces his official arrival on the American chess scene. We have an early, and very strong candidate for game of the championship right here! (Analysis provided online). Quite the wild affair between these two ladies, with the advantage changing hands on a regular basis throughout the game. It was Eswaran that got the upper hand in the opening, but Foisor quickly re-established the order after taking control of the “e” file. Eswaran’s bishop pair looked grim, but through smart maneuvering she managed to open the position and take control of the game. 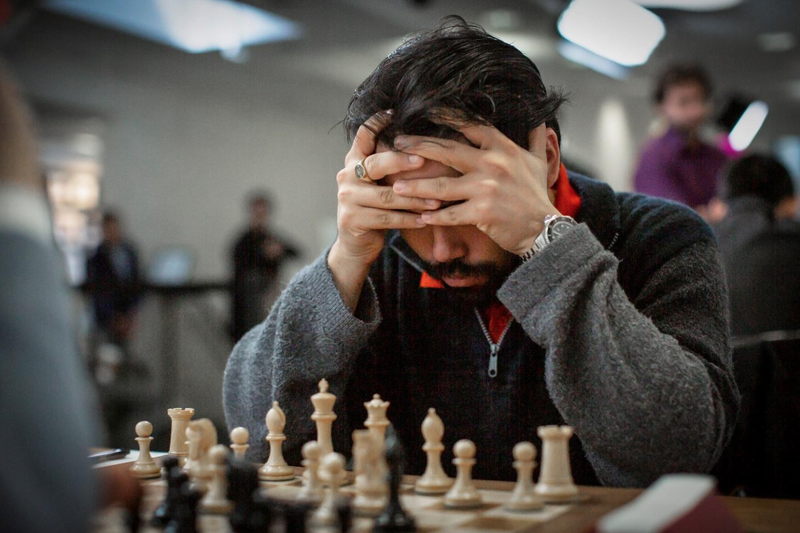 It was all downhill after that for Foisor, who was unable to contain the powerful action of Eswaran’s pieces. This was surely the game of the day, and GM Boros once again provides his thoughts and thorough analysis online. This was quite the shocker. 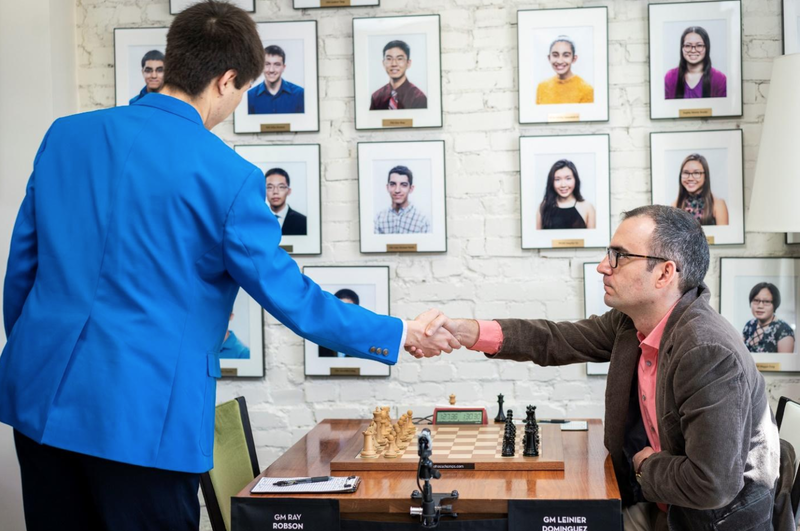 Sharevich played a beautiful game and looked to get an important win against Gorti, who has been having quite a difficult event up to this point. But just like thunder strikes when you least expect it, Gorti had her resilience pay off when Sharevich blundered the game away with the careless 64. h3?? This allowed the powerful 64…Rxg4! that ended the game on the spot. Sharevich was forced to resign as there was simply no way of preventing further material loss. Carissa Yip’s opening choice (2.f4?!) surely came as a surprise for Abrahamyan, who handled the opening phase timidly. 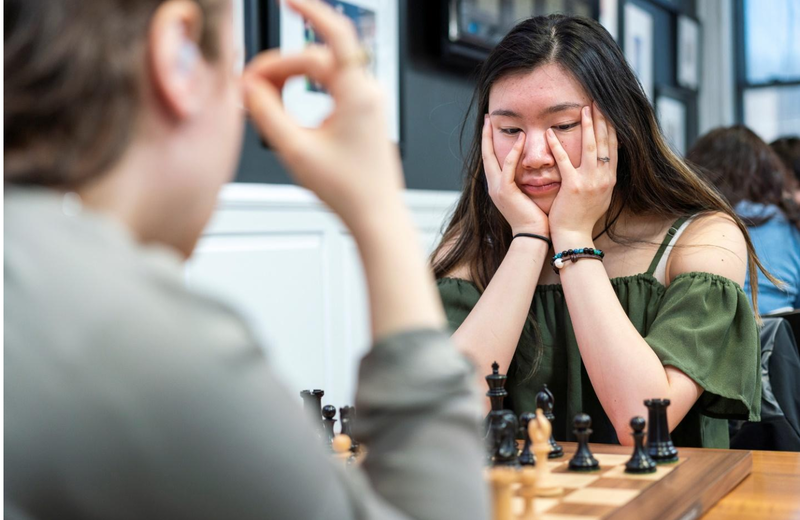 As soon as the ladies started maneuvering in the middle game though, Abrahamyan’s experience and understanding of the structures made all the difference. 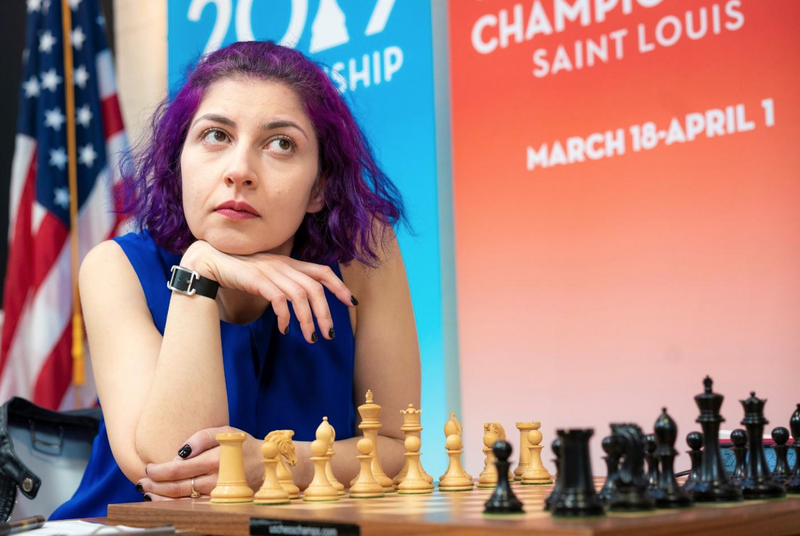 It was all Abrahamyan after move 10, as she started combining strategic ideas with tactical shots that were simply too much to handle for Yip. 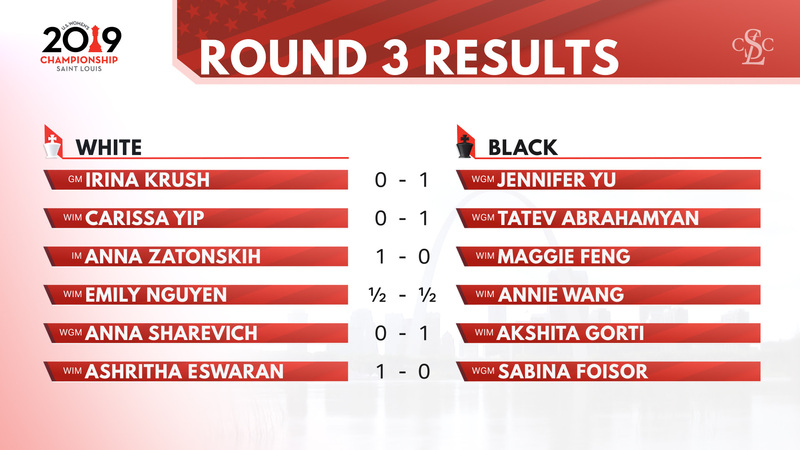 Abrahamyan scores her first victory and gets back to 50%, while Yip drops one point behind the leader, Yu. The 4-time champion is continuing her solid form as she beats Maggie Feng in a technical game. The side with the advantage was never in doubt from start to finish, as Anna dominated her young opponent in all facets of the game and converted with ease an exchange up endgame.